Australian pressing. A documentary film that follows the change in the hip hop scene in Australia for three years from underground shows to wider popularity. It takes the viewer way back to the beginning for some history of a time when gangs ruled parts of Melbourne, and graffiti writers were the representatives of local Hip Hop culture. 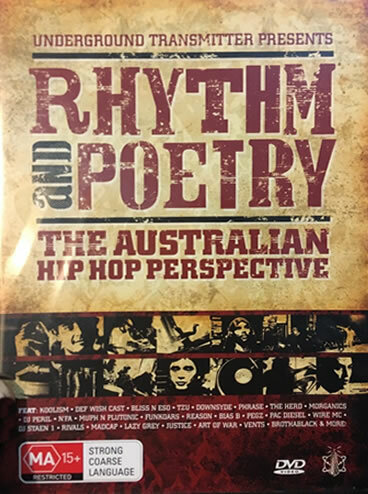 Covering the emergence of a local sound, to self-identity and using music to express yourself, Rhythm and poetry is the document of the hip hop scene in Australia from the 80s to today. Driven by the music of appearing artists and an original score by M-Phazes, it’s how Hip Hop came to Australia, and became Australian. PAL, Region 0.